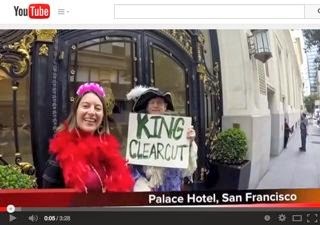 Fruit Growers Supply Company resurrects the Dutch Bear clearcut THP. This THP is 12 miles north of Yreka, CA, and about 4 miles north of Highway 96 and the Klamath River at an elevation of 3,600 to 5,680 feet. It is a re-submit of THP 2-13-087 SIS (Dutch Bear THP) which was withdrawn by Fruit Growers Supply Company on 11/13/13. 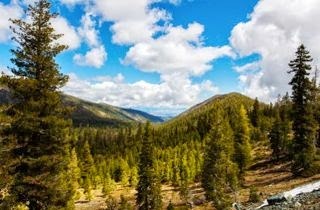 FGS is planning a mostly clearcut tractor and cable logging operation on steep slopes in Douglas fir, ponderosa pine, white fir, incense cedar and sugar pine forests. The THP area flows down Dutch Creek into the Klamath River which is listed as impaired for temperature, dissolved oxygen, nutrients, organic matter and microcystin. Dutch Creek supports steelhead, while the Klamath River supports chinook salmon, coho salmon and steelhead. Fruit Growers Supply Company is planning to use ground based equipment in areas designated for cable yarding for swing yarding, where deflection is poor, to construct firebreaks and to provide tail holds. Excavators are also proposed for site preparation in units designated for cable yarding. An exception to the HCP is being proposed to allow for road construction and/or re-construction in the period from October 15th to November 1st and from April 15th to May 15th under limited circumstances. There are 41 road drainage sites planned for work including rocking, dip construction, culvert repair and replacement, and road bed reconstruction. 159 acres of “Alternative Prescription” similar to selection logging is being proposed to allow for logging inside spotted owl nesting habitat. For spotted owl site SK362: this THP will create 253 acres of non-habitat within 1.3mi; reduce foraging habitat by 1 acre within 1.3mi; and reduce nesting habitat by 23 acres within 1.3mi (this owl area already has no nesting habitat within .5 mi). For spotted owl site SK363: this THP will create 162 acres on non-habitat within .5 mi; reduce foraging habitat by 29 acres within .5 mi; and reduce nesting habitat by 33 acres within .5mi. For spotted owl site SK467: this THP will create 129 acres of non-habitat within 1.3mi; reduce foraging habitat by 58 acres within 1.3mi; reduce nesting habitat by 14 acres within 1.3mi; and reduce high quality nesting habitat by 5 acres within 1.3mi (this owl area has only 1 acre of nesting habitat within .5 mi). Potential habitat exists for Townsend's big eared bat in an abandoned mine shaft in Section 17. More information is available on the THP Tracking Center website. Sierra Pacific Industries to clearcut log on steep and unstable slopes NE of Lake Oroville. This THP is about 15 miles NE of Lake Oroville and about 5 miles NE of the town of Feather Falls, CA at an elevation of 2,800 to 4,750 feet. Sierra Pacific Industries is planning a mostly clearcut tractor and cable logging operation on steep and unstable slopes in white fir, Douglas fir, sugar pine, ponderosa pine and incense cedar forests. There are 8 road failure sites including fill slope and cut bank failures along roads and several skid trail related failures, and multiple landslide terrain features including hummocky ground, steep streamside slopes, steep scarps, and disrupted ground. SPI is planning to use a tractor road inside a class II watercourse, a skid road between a class II and class III watercourse, and 2 tractor roads inside a class II and class III watercourse. They also want to be able to build temporary roads less than 500 feet without prior designation on THP maps. 51 road drainage sites are planned for work including rocking, dip construction, culvert repair/replacement and road bed stabilization. Upswept moonwort was found .22 mi SW of unit 25; Mildred’s clarkia was found in unit 27, within a plantation adjacent to unit 26, and in sections 14 and 23; Mosquin’s clarkia was found in units 26, 18 and 20, and in section 30; Coleman’s piper was found in units 27 and 29; and obtuse starwort was found in section 22, .15 mi SE of unit 25. More information is available on the THP Tracking Center website. 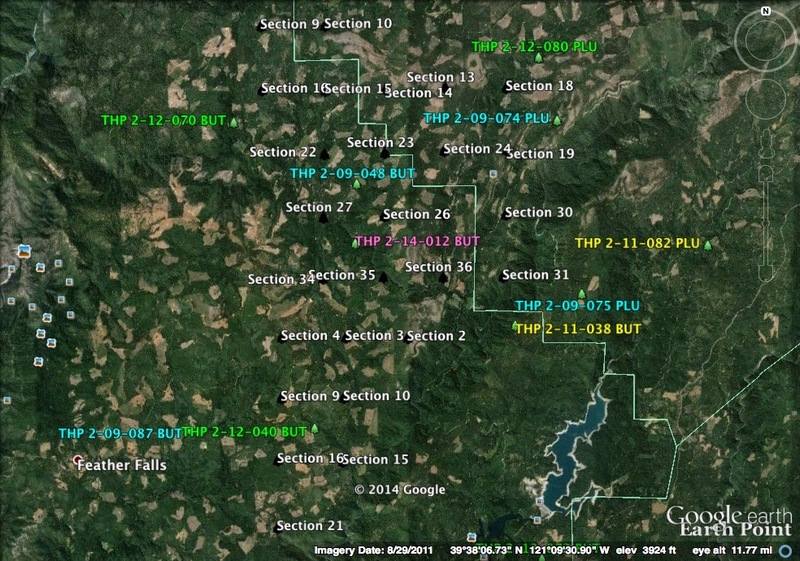 This THP is about 15 miles NE of Chico, CA and about 3 miles NE of Stirling City at an elevation of 3,400 to 6,200 feet. Sierra Pacific Industries is planning a mostly clearcut tractor and cable logging operation on steep and unstable slopes in white fir, Douglas fir, sugar pine, ponderosa pine and incense cedar forests. 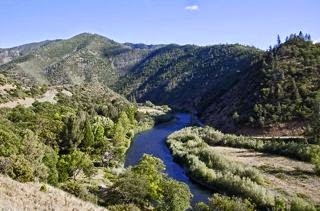 The THP area is near the headwaters of the West Branch Fork of the Feather River which is a popular recreation area with several small lakes and meadows. There are 5 landslide terrain sites including steep inner gorge areas and debris slides above Last Chance Creek and along the southern border of unit 1, a steep headwall along a class III watercourse, and over steepened unstable slopes that flank Last Chance Creek and a class III watercourse near unit 20. Four oversized units are proposed, and SPI wants to use an existing landing near a seep in a watercourse area. There are 88 road drainage sites planned for work including rocking, dip construction and culvert repair and replacement. Mildred’s clarkia was found in section 11 and in forest openings in units 1 and 2, close throat beardtongue was found in sections 1 and 11, and obtuse starwort was found in section 1 and 2. An osprey territory is located nearby at Philbrook Reservoir. More information is available on the THP Tracking Center website. SACRAMENTO, CALIF. – Today, a coalition of environmental groups including Sierra Club California and Friends of the Earth delivered a letter to California Air Resources Board Chair Mary Nichols and Climate Action Reserve Chair Linda Adams urging them to fix a fundamental flaw in the cap and trade regulations implementing AB 32, the state’s Global Warming Solutions Act, that allows companies to sell offset credits for “even-age management” -- a practice that involves clearcutting forests and replanting monoculture stands of uniform age. 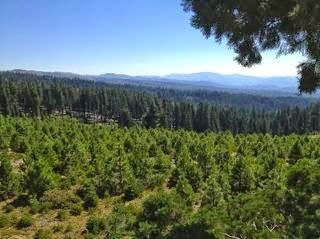 The letter charges that California’s current forest protocol “undermines the credibility of California’s cap and trade system by incentivizing the destruction of old-growth forests,” and calls on CARB and CAR to adopt an immediate moratorium on registration of carbon credits from forest projects that entail clearcutting.